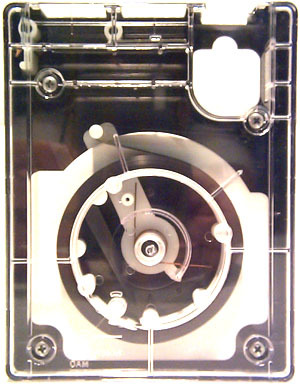 "Cart Machines" played endless-loop tape cartridges, which were historically used to hold commercials, jingles, and announcements. Audio was recorded in mono or stereo (on one or two tracks), and 1 KHz cue tones (which told the playback deck when to stop) were recorded on a separate track. 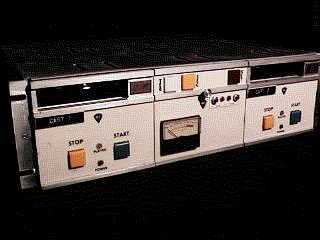 The tape format was introduced to the National Association of Broadcasters by Collins Radio in 1959. 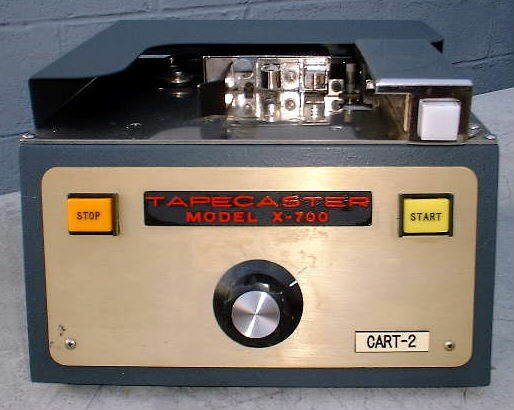 In that same year, Broadcast Electronics introduced one of the first mono cart machines, the Spotmaster. Since that time, manufacturers added stereo capability, additional secondary and tertiary cueing tones and even digital timers. 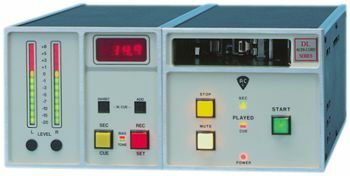 Many playback decks provided relay closure outputs that were activated in response to detection of the secondary and tertiary tones (at 150 Hz and 8 KHz, respectively). 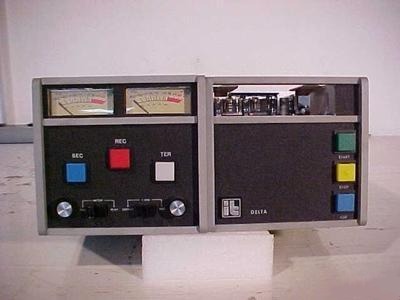 Most production studios also had bulk erasers and splice finders to go along with their cart recorders. Major manufacturers of cart machines included International Tapetronics Corporation (ITC), Fidelipac, Audicord, Ampro, and Gates/Harris. These days there are very few cart machines still manufactured, as a large number of stations have converted to digital technology. CartChunk is one of the latest digital formats, combining a standardized labeling information format with the .WAV file format. Click here to read an interesting article by Roy Pressman about cart machines. I'm interested in collecting information about the companies that used to make these fantastically rugged machines, so any info that you could pass along to me would be appreciated. Here are some shots of a few classic cart machines. 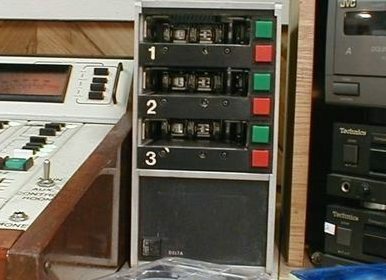 ITC Delta Stereo Cart Recorder - The Delta IV record amp (left) is a separate unit from the Delta I tape transport (right). Packaging the record electronics in a separate enclosure was common in several cart machine lines. ITC transports included a "dummy" head where the record head would be placed. When you bought a record amplifier (such as the Delta IV), you got the record amp, an interconnecting cable (different, it seemed for ever make and model), and a record head, which you installed and aligned VERY precisely. ITC was purchased by DRS Technologies around 1996. DRS manufactured and supported the Delta series machines and other lines for a number of years, but has since discontinued them. If you've got ITC cart machines (or parts) that you'd like to sell, please drop me a line. Click a link below for specs on the ITC lines. Delta Series - Workhorses of many stations. Delta Series 99B - Possibly the ultimate machine. Series 1 - A new generation of ITC machines. Series 2 - DRS's last attempt at ITC machines. ESL-V - Splice-finder/eraser. Click here to see more erasers from other manufacturers. ITC Cart Machine Pinouts - Pinouts for those weird Cinch-Jones connectors on several types of machines. Advanced Recording Products - Also suppliers of reel-to-reel and other tape formats. CartGuys - Now owners of the Fidelipac Dynamax line. 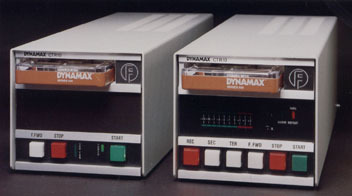 The Dynamax CTR10 Series features: fast forward (3x normal speed); flashing cart-played indicator; strappable repeat play disable; selectable high speed recue; all front panel switches illuminated; front panel 1 kHz defeat with dedicated indicator; versatile, switch-selectable audio/test metering; bar graph LED VU meters. The CartGuys also sell cartridges and do repair of Fidelipac and ITC machines. They're also searching for rebuildable ITC and Dynamax machines, and sell refurbs to third-world countries as well as small-market stations in the U.S.
ACC Electronics - Originally made AudiCord machines. AmpServices - Servicing Broadcast Electronics machines. Hall Electronics - All kinds of used broadcast gear and manuals (now out of business, but selling off their back stock). Magnetic Reference Laboratory - Suppliers of excellent calibration tapes for cart and reel-to-reel.